Gong therapy is the therapeutic application of the sound of the gong and related sound tools for the purpose of healing and wellbeing. Creating a nurturing and transformational space, at the heart of this practice is the sound and vibration of the gong, which works as a tool to balance the physical body, mind, emotions, energetic body, and spirit. Known as the sound of total resonance, the sound of the gong gives the body a sonic massage helping to: stimulate circulation, activate the parasympathetic nervous system, and detox; slow down brainwaves and connect with meditative states and insights; let go of emotional ‘burdens’; clear energetic debris; and expand awareness. If you have any questions or specific requirements, please contact Patricia or Maria so they can discuss what best works for you. Patricia and Effie also offer regular Gentle Yoga and Gong Bath workshops on Sunday afternoons. Check the workshop schedule for more info and to sign up. 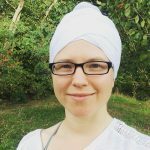 Maria also offers Kundalini Yoga classes with Sound healing, check timetable for classes.